Services we specialize in: Rare book and document restoration and/or conservation. 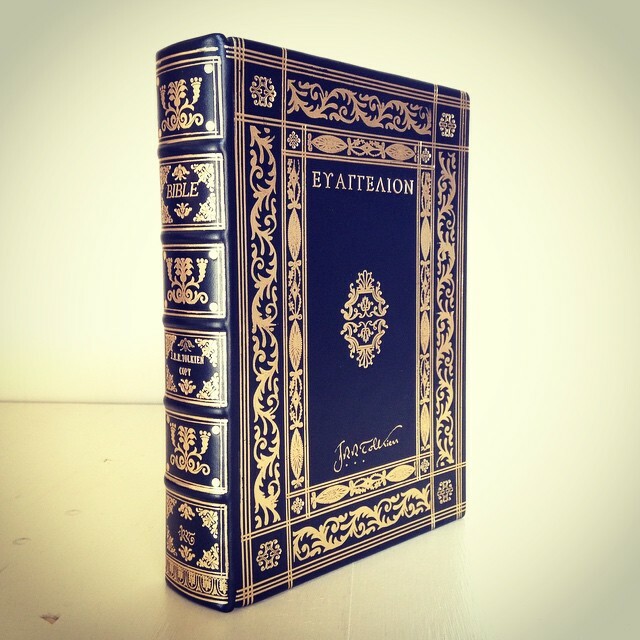 Custom enclosures that house antique items and collectible books and documents that may not be good candidates for restoration, rebinding, or mending. 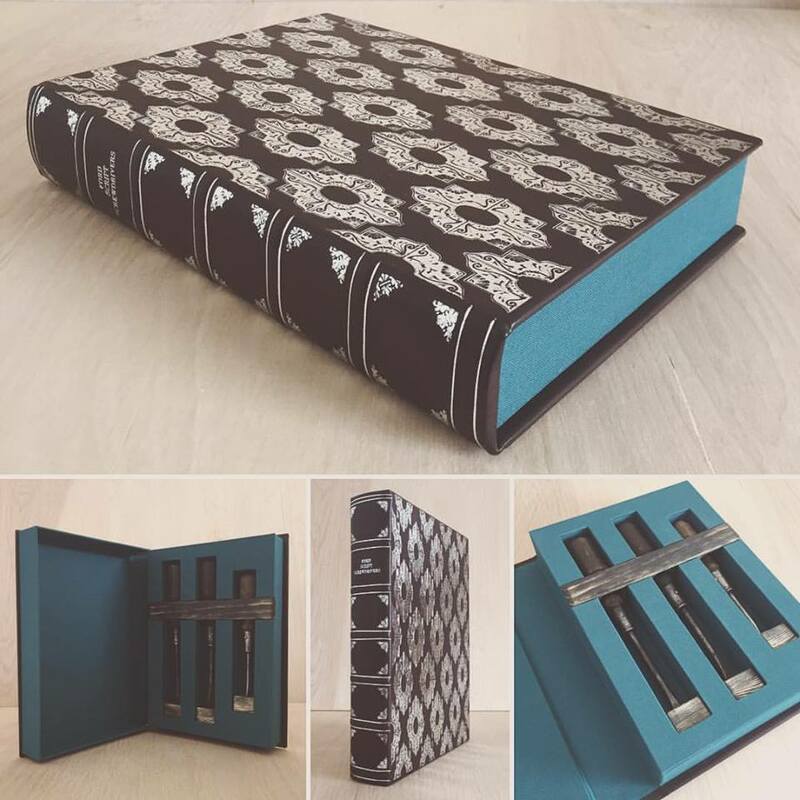 Custom fine binding (rebindings of your favorite books, novels, or making a special blank book). When our schedule permits, custom bookplate design and/or printing. See full details of our services offered as you scroll down. We are passionate about preserving history through rare book and ephemera restoration and conservation, and so we're careful to marry archival methods and materials with a traditional period accurate approach. This approach ensures that your items will be both properly and aesthetically repaired, and last for years to come. Having your rare and/or collectible books properly restored by a professionally trained and experienced conservator means more than just having your books repaired; archival restoration adds years to the life of your books, which will always add value. Conservation trends are always changing, but the importance of ensuring history lasts never does. Our Ethics in Conservation & Restoration Statement HERE. Because damage varies with each book or document, preservation is priced based on the time it will take to restore an item. Email us a few photos showing the damage, and we'll send an estimate (eidolonhouse@gmail.com). "Constitutions of the Thirteen United States", 1792, published in Paris in French. Presentation copy to Senator Joseph S. Clark from François Mitterrand in 1966. Leather restoration. Towards the Conversion of England, 1945. Reattached paper covers. 1611/13 "She" KJV Bible. Historical Rebind. 1830 Book of Mormon. Leather restoration. Hand Coloring 19th C. Lithograph. 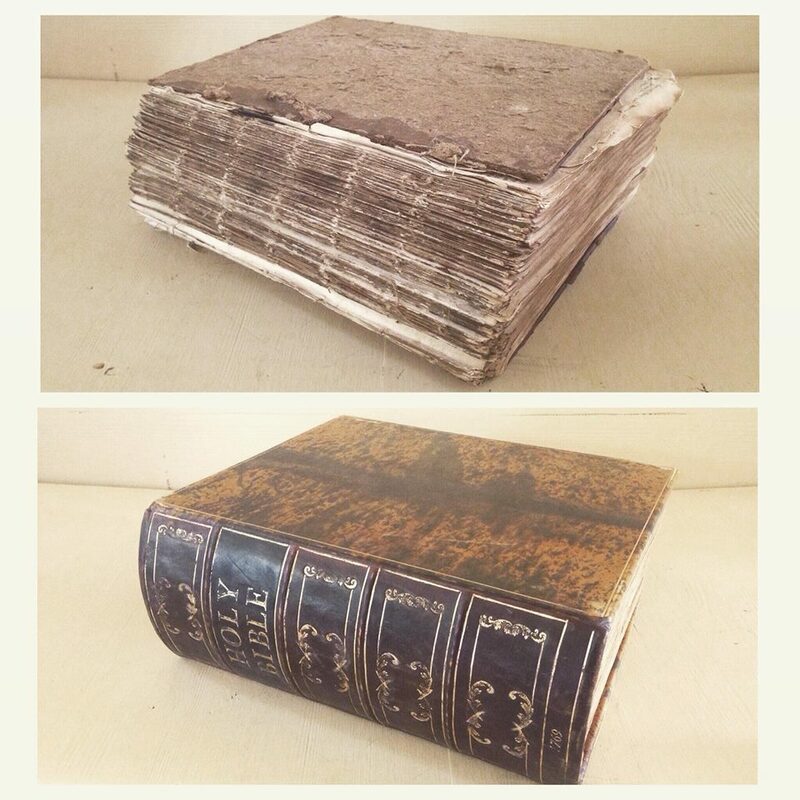 Before & After: Humas, o cinco libros de la ley divina, (Pentateuch, or five books of the divine law). Edited by Menasseh Ben Israel, 1655. Rebacking. 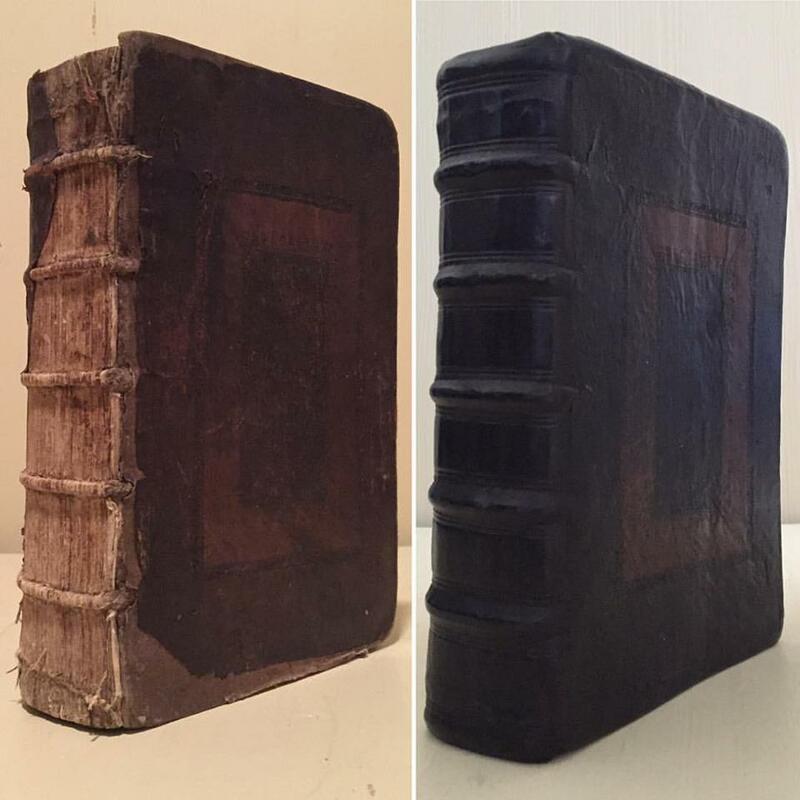 1769 KJV Bible - Text block consolidation & Historical Rebind in a Treed calf design. 1937 Mein Kampf, Adolf Hitler. General restoration. Before & After Grease Stain Removal. 1569 Great Bible - Historical Rebind. Nauvoo Voice of Warning. General Restoration. Pilgrims of Hope, by William Morris, 1901. End-Cap Rebuild. Emma, by Jane Austen, 1841. General Restoration. 1612 KJV Bible. Historical Rebind. Removing hide glue and tissue from a title page of an 1840 Book of Mormon. Live Stock and Complete Stock Doctor A Cyclopedia, 1913. 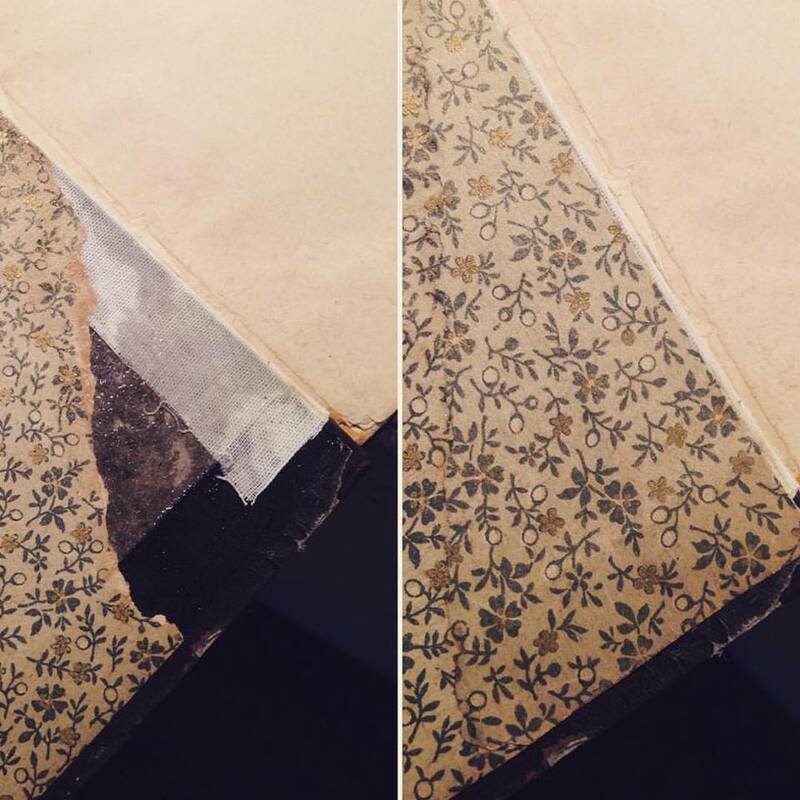 19th C. paper restoration, filling in missing letters. 1570 Geneva Bible Historical Rebind. Before and after paste down repair. 1835 D&C. 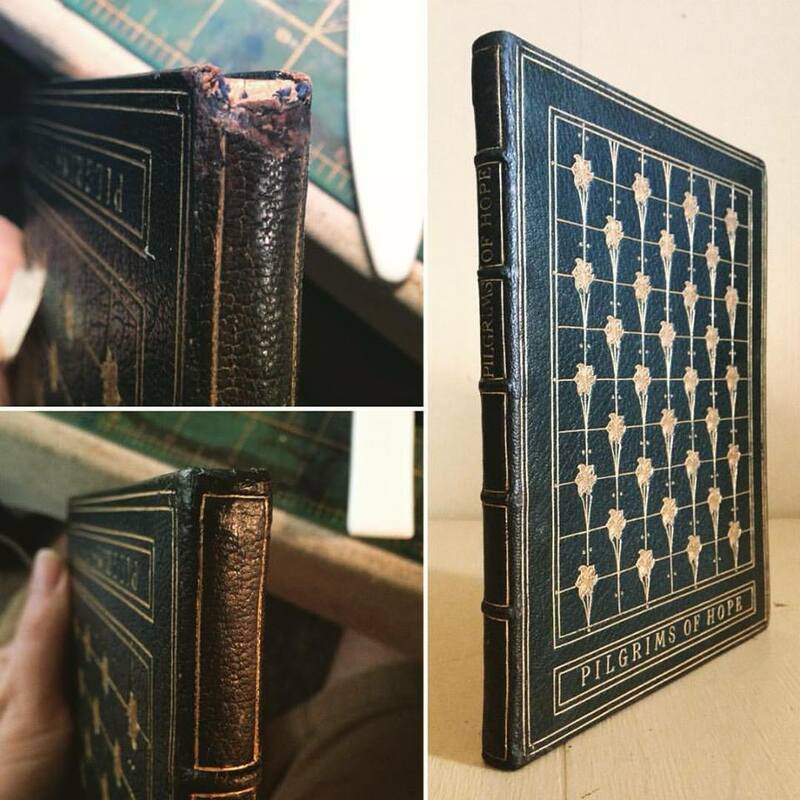 Spine repair & leather restoration. Text Block Consolidation and/or Resewing. Gold Fill-In (using Shell Gold). Facsimile Reproduction (using digital and/or traditional letterpress/engraving printmaking methods from the past). Handmade Brass Clasps & Hardware. 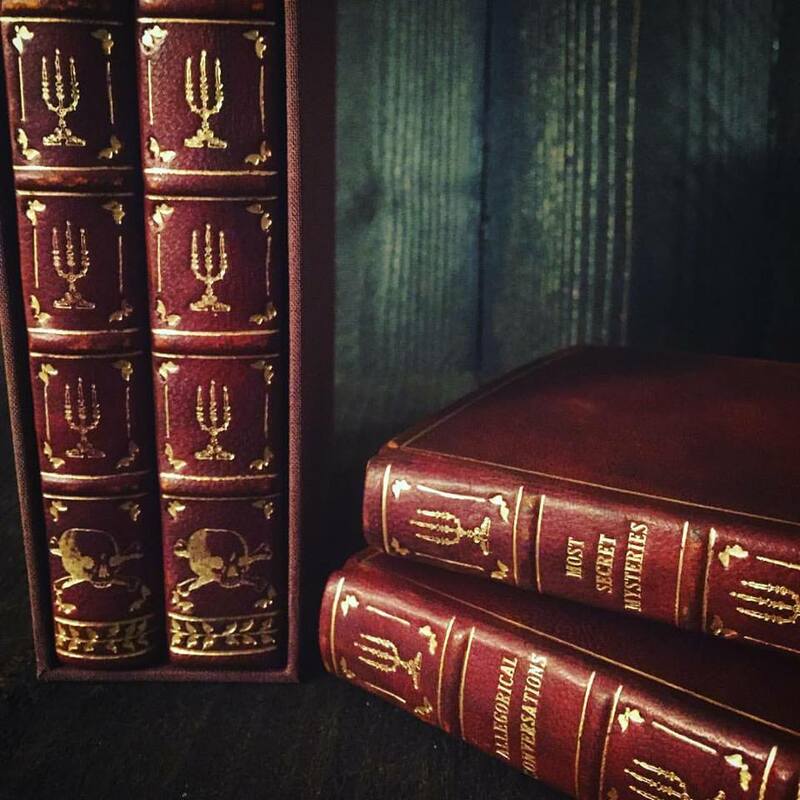 Our custom enclosures are beautiful, sturdy, functional, and guaranteed to showcase your books or antique items, as well as protect them. We combine hard wearing book cloth with high quality bookbinding leather to create long lasting, environmentally stable protection for your books and/or treasured items. Leather enclosures come standard with tooled spines and boards, tooling in gold and/or blind. Cloth enclosures come standard with paper or leather labels on the spine or boards. 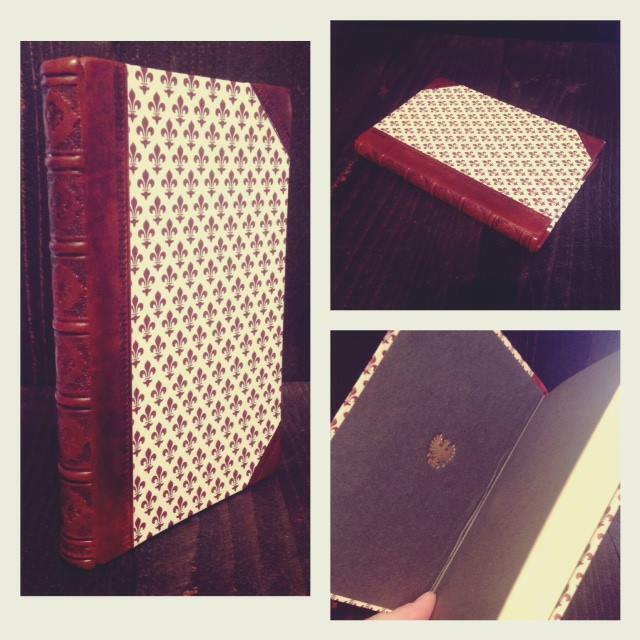 Half Leather (leather spine w/leather corners, & boards covered in cloth or marbled paper). Leather Spine (boards covered in cloth or marbled paper). Enclosures with recessed trays and/or hidden compartments. Nothing sits in the hand like a beautifully bound book. 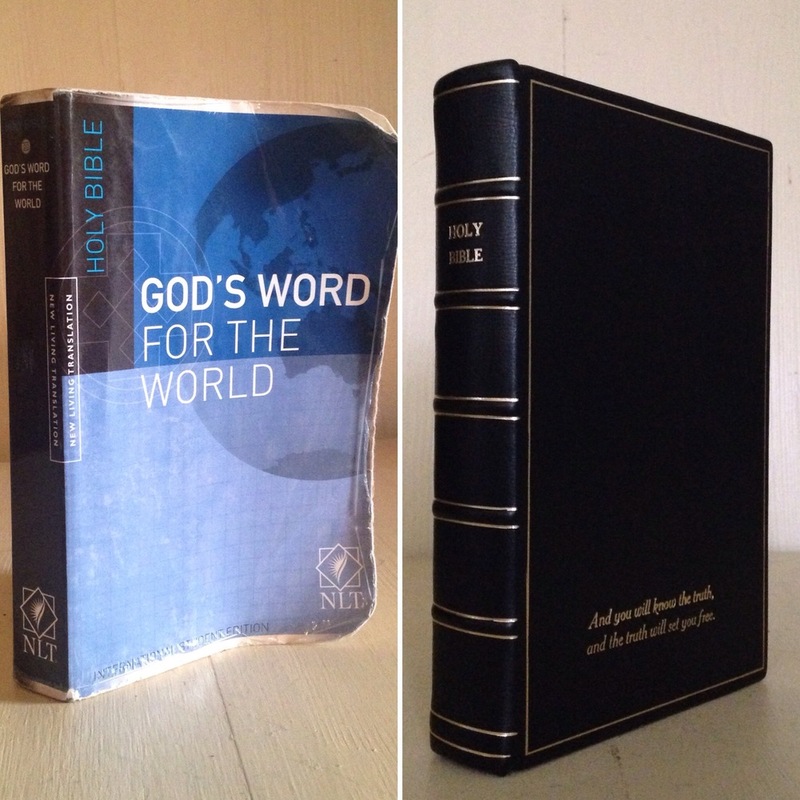 We take great pleasure in working with you to bind your favorite book, journal, personal scriptures, etc. Our custom bindings are of the finest quality and are made to become family heirlooms. Pricing begins at $250 depending on the design, materials used, and size of the book. 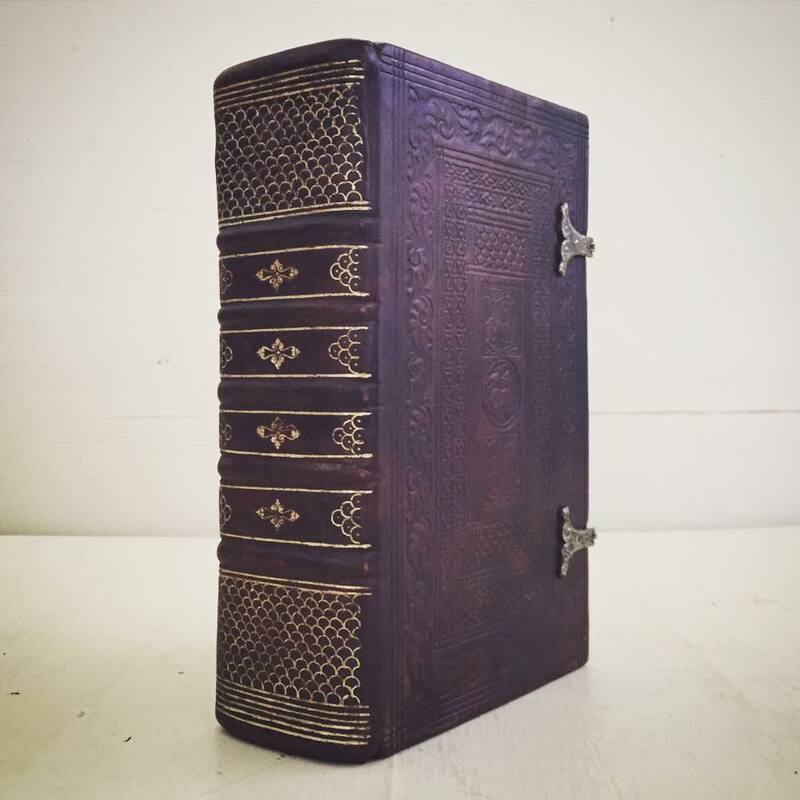 Half Leather Binding (leather spine with leather corners). 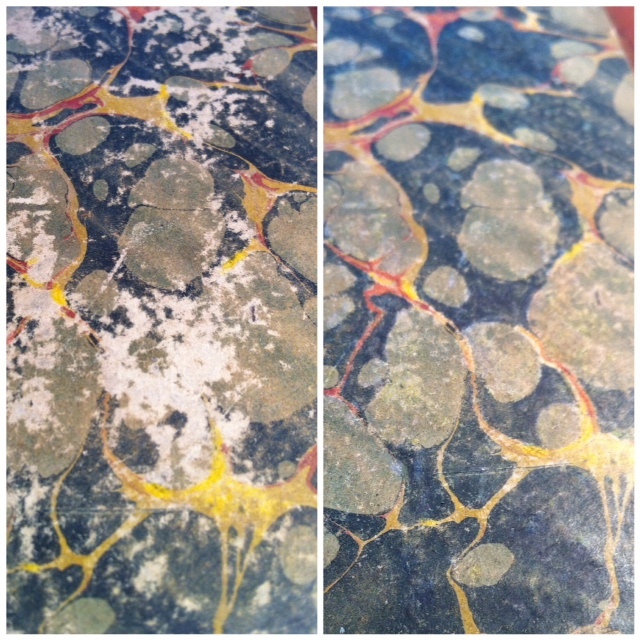 Edge Treatments (colored edge, gauffering, fore edge painting). Hand Marbled Paper or Paste Paper (for end-sheets and/or board covers). See more of day-to-day life in the bindery HERE! Thank you! You can expect a response within 24 hours!